American Retail Company Giving Away Free Engraving for In-Memoriam Gifts. Eco Wind Chimes, a U.S. based company, is announcing free engraving services for all memorial gifts for the families of those who were service members or community servants. 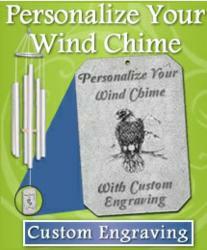 Eco Wind Chimes offers free engraving services. We don’t ever want to put a price on a person’s name or memorial message. This offer will stand as long as our wind chime company does. It is a token of appreciations for the heroes’ families who are left behind. Families and friends who are buying a wind chime as a sympathy gift or memorial relic simply need to contact Eco Wind Chimes. “The process is very simple. A customer selects a wind chime from the Eco Wind Chimes’ website. Then they can personalize it by clicking here: http://www.ecowindchimes.com/Personalized-Wind-Chimes-from-Grace-Note-s/57.htm . Upon check out, he or she should notate why the product is being purchased and for whom. One of our courteous customer service representatives will review the notes and refund the costs associated with any engraving services,” continued Betzen.